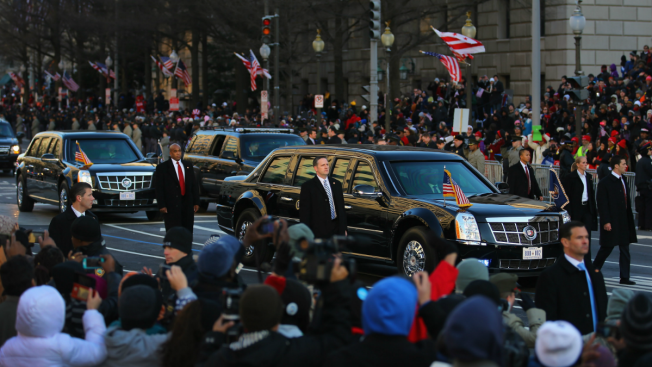 U.S. President Barack Obama drives down Pennsylvania avenue in his vehicle during the Inauguration Parade on January 21, 2013 in Washington, DC. The President was sworn in for second term. The Presidential Inaugural Committee has released what it’s calling the “initial list” of groups who will participate in the parade following President-elect Trump's inauguration on Jan. 20. Those from the Chicago area include a delegation from Bourbonnais’ Olivet Nazarene University, as well as the Mid America Cowgirls Rodeo Drill Team from Three Oaks, Michigan. The Olivet Nazarene marching band has about 140 members, while the Three Oaks Drill Team has members will include 18 horses. The drill team has been fundraising to cover the cost of the trip, about $18,000. Members of the team range in age from seven to mid 60’s.